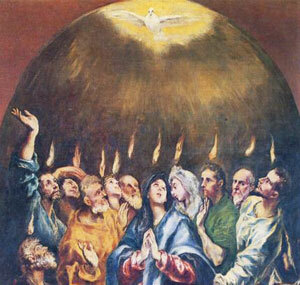 Pentecost by El Greco, 17th century..
"If I do not go," Jesus told his apostles, "the Advocate will not come to you. But if I go away, then I will send him to you" (John 16:7). "Do not leave Jerusalem, but wait there for the gift my Father promised, the gift of which I told you. John baptized with water, but in a few days' time you will be baptized with the Holy Spirit" (Acts 1:4-5). These were the Lord's parting words to his disciples, the promise that united them as they made their way back to the city to wait in joyful, expectant faith for the coming of the Holy Spirit. Not that the Spirit would only begin to work among men after Jesus had returned to the Father; he had been at work in the world since the dawn of creation. God's people were not to experience a hitherto unknown indwelling of the Holy Spirit, but those who already belonged to him would know a more abundant outpouring, an increase rather than a first reception of his gifts. Pentecost is the culmination of the work of our salvation, that mighty plan of God's mercy which originated long ago when the Lord first began to form a people for himself. How many mysterious signs can be discovered in this feast which link the old dispensation with the new, teaching us that the law of Moses was the herald of the grace of Christ, in which it was to find its fulfillment! Fifty days after the sacrifice of the lamb marking the deliverance of the Hebrews from the Egyptians, the law was given to the people of Israel on Sinai; and fifty days from the resurrection of Christ after his immolation as the true Lamb of God, the Holy Spirit came down upon the new Israel, the people who put their faith in Jesus. The same Holy Spirit was the author of both Old and New Testaments; the foundations of the gospel were laid with the establishment of the old covenant. What a wealth of meaning can be found, therefore, in the opening words of the second chapter of Acts, "When the days of Pentecost were fulfilled"!